The MCBSTM32F200 board includes a low-power, 3-axis STMicroelectronics LIS3Dh accelerometer at location IC26. It is controlled using an I2C serial interface connected to port pins PB8 and PB9. 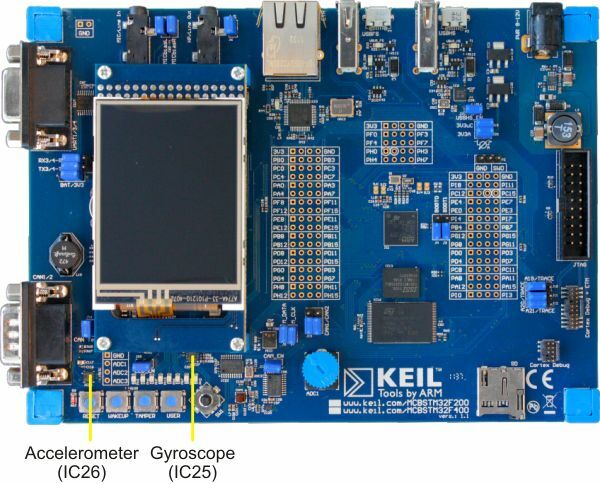 The MCBSTM32F200 board also includes a low-power, 3-axis STMicroelectronics L3G4200D MEMS inertial rate sensor(gyroscope) at location IC25. Like the accelerometer, it is controlled over an I2C serial interface and is also connected to port pins PB8 and PB9.